The FARC published a video which shows their version of the release of General Ruben Dario Alzate. The video (above) shows alias “Pastor Alape” (wearing the casual blue shirt and the Panama hat) listening closely as Gloria Urrego, the lawyer who was kidnapped alongside the general, explains the two were in Chocó region in an effort to promote development, to set up a project to harness the energy of the Atrato River and so provide electricity for the community of Las Mercedes. Urrego explains she was not there in her capacity as a lawyer handing out indictments, or such. Pastor Alape is shown bringing General Alzate newspapers and magazines, which explained the story of how his kidnapping caused President Santos to suspend the peace talks. A lot has changed from the Pastor Alape who appeared in front of cameras before. The video below was uploaded in October 2011. In today’s Pastor Alape, the harshness has distilled itself somewhat. His stance and his voice are different, too. He became part of the FARC’s ruling secretariat when military commander alias “Mono Jojoy” was killed in September 2010. Alias ‘Pastor Alape’ is Félix Antonio Muñoz Lascarro, born on January 5, 1946 in Puerto Berrío in Antioquia department. He joined the FARC in 1983, as a twenty-seven year-old lured in by his time as a member of the Communist Youth Movement. 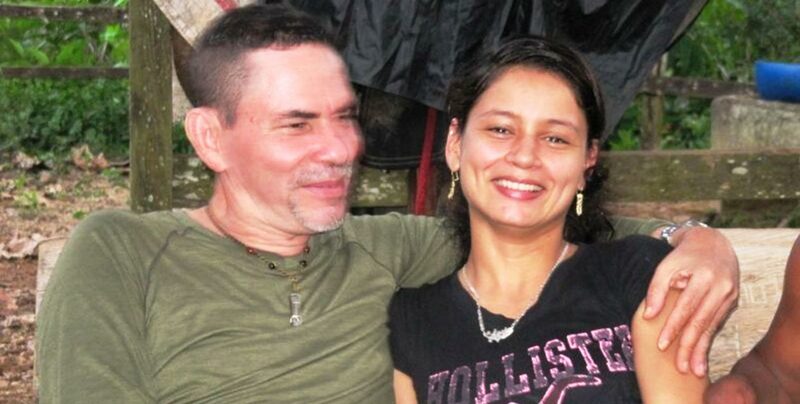 He was part of the personal guard of alias “Jacobo Arenas,” the FARC’s ideological head. From Arenas, Alape received much political indoctrination, and so he went on to be an instructor at the “Hernando González Acosta” training camp. In mid-1989, Alape formed the 45th Front, the “Atanasio Girardot” Front. In 1991, he was ascended to command the 52nd Front, the “Juan de la Cruz Varela” Front. Under him, the group destroyed much electrical infrastructure in the Llanos Orientales region. In August 1993, Alape was again promoted to form part of the Magdalena Medio Bloc. By 1996, he expanded his reach to Santander and Norte de Santander departments, as well as to northeast Antioquia, southern Bolivar, and western Boyacá departments. As Alape’s FARC career rose, he was given the task of preparing promising young men at the “Ricardo Franco” training camp, located in the municipality of Landázuri in Santander department. Alape’s rising commanders went on to lead fronts in the Magdalena Medio Bloc. Alape is also the FARC’s supreme business man: he strategized and implemented the FARC’s cocaine policies, directing and controlling the production, manufacture, and distribution of hundreds of tons of cocaine to the U.S. and the world. And to further raise funds for the FARC, he helped set in motion the “taxation” of the drug trade in Colombia, extortioning coca farmers for their “right” to grow the crop, which, in turn, the FARC buys. He ordered that farmers who sell cocaine paste to other buyers, namely the paramilitaries, be bombed or murdered. According to the U.S. State Department, Alape oversaw the production of the entire Magdalena Medio Bloc’s cocaine supply. The U.S. offers a reward of $2.5 million for information leading to his arrest and/or conviction. Alape is also linked to illegal mining and arms trafficking. He is a negotiator for the peace talks with the government now taking place in Havana. Note that the recent video (top one) was filmed, edited and released by the FARC. Certainly, it seems the FARC’s top commanders are cultivating an image, strategizing their chances to be accepted by an increasingly unforgiving public in preparation for a possible referendum on the peace talks. « Decoding photos of opposing sides embracing.